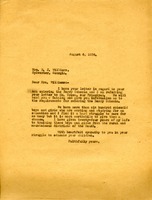 Mrs. Eller writes to Martha asking to meet with her the next time she is on the Mountain about getting her son in school. 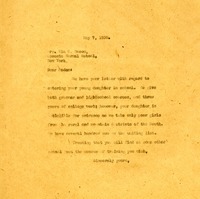 Martha Berry is denying entrance to Mrs. Morris' daughter because the school only takes poor girls from the rural and mountain districts of the South. 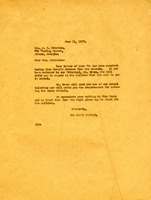 Martha replies to Mrs. Williams inquiry about her son entering Berry and has referred the letter to Mr. Green who will send her information on the requirements to enroll at berry.